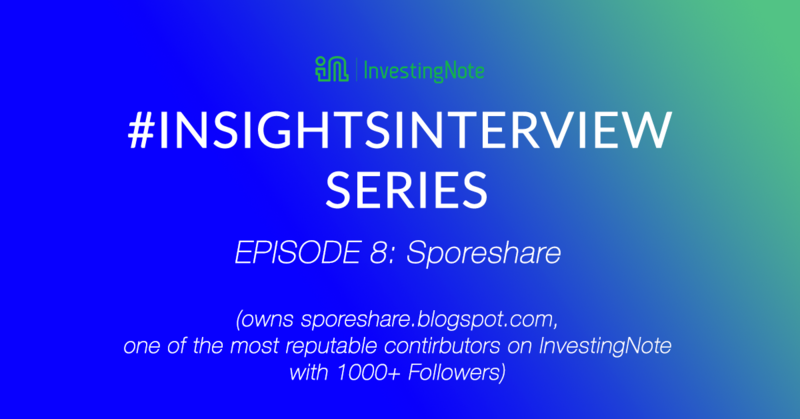 Sporeshare is one of InvestingNote’s most reputable member in IN Member’s Ranking with more than 1000+ followers, specialising in technical analysis. He owns a blog, http://sporeshare.blogspot.com. Till date, he has created many educational post and investment ideas and spurred discussions on InvestingNote platform. This is #InsightsInterview, Episode 8. I would say is basically due to the launch of Singapore Telecom or SingTel IPO share for all Singaporean at a special offer price in Nov 1993. I started to apply and open an securities account with one the brokerage house and doing basically known as “tikam” investing – usually based on tips from broker or friends or colleagues. Swing trader. Based on the chart patterns presented at a particular point of time. A Swing trade can be a continual process and go into a Trend/Position trade at a longer term perspective. A bullish uptrend chart patterns may continue to rise further after taking a short pause/breather. Overtime, it may drag into a period of 3 to 6 months for a nice trading position. The best investment would be Keppel Corp & Sembcorp Ind of which has been able to make a nice profit. We can always enter and exit the same counter several times and yet we are still able to make profit again and again. The worst investment would be Noble Group. Don’t fall in love with any counter. It is important to stick to your trading or investing plan and when the time has come to cut loss, we shouldn’t be hesitated to do it. It is also important to educate ourselves with basic Financial Analysis such as knowing the financial health of the company that we are dealing with. I would say some of the IN users are very helpful in parting their investing knowledge and idea. Particularly, JeremyOwtaip & Turtle_Investor. I have been able to pick up some investing ideas from them. Yes. For trading, I would not touch ultra-penny counter that is trading below S$0.20. Ideally, would be at least S$0.40 – S$0.50. In trading , we would enter a trade only when the market confirm the setup is being activated/triggered. Do not anticipate and wait till market to confirm your opinion . It is ok to be a little bit late in a trade, it is ultra important or assurance that your opinion is correct. Patience is key in trading in order to win the trade. I am having 45% in equities, 15% in Bond and 40% cash. Current market is being clouded by the trade war issue. Short term uncertainties is causing the market to be swayed more towards the Bear territories. STI has corrected from the High of 3600 to the current level of about 3100 – 3200 level. It is now hovering in a CRITCAL situation. If it not able to hold up well above 3100 level then it may likely go further down to test 3000 level . Unless, it is able to stage a strong recovery and rise above 3250 level in order to reverse this down trend. Only trade when the trading opportunity arise. It applies to both approach. It is very important to work out your trading position / target for a particular counters by working out the Entry Price, Stop Loss price, Target Price, Position Sizing to work out the maximum no of share to buy in advance while waiting for the market to confirm your opinion. Do not trade without a proper plan..
You may keep track of your total portfolio either using a excel spreadsheet or by relying on the brokerage house trading system to manage your total no. of counters at any one time. For trading, be firmed in executing your stop loss strategy. Also don’t be too eager to take profit to early. Let your profit run. For Investing it is good to read up and educate yourself to know the basic financial analysis. Learn how to identify good company to invest . Pick those company/counter that you are familiar with their business. Buy only those counter that is trading below its Fair value etc.. It is very important to equip and educate ourselves with the Trading or investing knowledge. Don’t rely on tips! Ensure we have a proper plan in place whenever we enter a trade. Don’t speculate and trade without knowing what you are trying to achieve. Sporeshare currently has more than 1,000 followers and provide many accurate stock estimates. Follow him to get the latest updates and educational posts on the Singapore stock market.